Rinse chicken wings and pat dry. Remove tip and discard; separate each wing at the joint into 2 pieces. Place wings in a shallow dish and pour over the soy sauce, ginger, parsley or cilantro, garlic, and lemon juice. Toss well to coat; marinate, refrigerated, for 2 hours. Remove wings from marinade and pat dry; season with salt and pepper. In a large saute pan over medium-high heat, melt the butter in the olive oil. 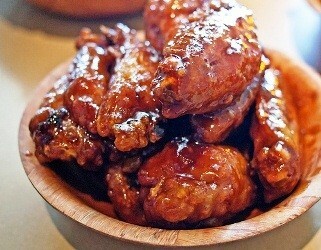 When the butter stops foaming, add the honey and chicken wings and fry until browned on each side, about 5 minutes. Continue cooking the wings, turning them over often to coat them as the glaze reduces. Cook until the wings are sticky and cooked through, then garnish with sesame seeds. Preheat the oven to 375°. Roast the eggplant over an open flame or under a broiler until softened and charred, 12 minutes. Let cool completely. Drizzle eggplant with the oil and season with salt and pepper. Not Included in Large Real Box: Soy Sauce, Salt, Pepper, Olive Oil, Butter (except in 3-5 person boxes), Honey, Sesame Seeds.